As a dog person, I'm a sucker for any book that features a canine as the main character. 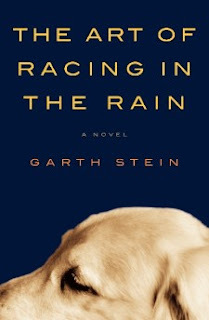 In 'The Art of Racing in the Rain', man's best friend plays a unique role as the narrator, reflecting upon a life lived full of devotion and love under extraordinary circumstances. Our storyteller, a mix breed called Enzo, comes to live with car racing buff, Denny and together they navigate life's challenges, touchstones and tragedies. Denny meets Eve, they're blessed with a daughter, and all is perfect in their world. But just like during a car race, situations spiral out of control and the unspeakable happens to destroy their idyllic bliss. Enzo is the ideal witness to the events that befall Denny and his family, and as dog lovers know, a pet can offer comfort when human counterparts fail. Enzo, however, wishes to be human, and dreams of the day that he can communicate in a manner that befits him. Believing that dogs can return as a human after death, he vows to someday tell Denny how much his love meant to him. This story is part heartbreaker, part inspiration. You'll never look at your dog in the same fashion after reading Gareth Stein's novel. If you've always believed that there is more to your pet than a waggy tail and those soulful brown eyes, this book is for you. Oh, good Lord. As much as I'd love to read a book like this, I just don't think I could handle it. My parents and my sister all read Marley and Me when it first came out, and all three of them bawled their eyes out. I cry at the drop of a hat (I kid you not, I cried in Bring It On. Yeah, I'm really *that* pathetic...), so I just couldn't get through reading something like Marley and Me or The Art of Racing in the Rain. Especially 'cause our dog is a yellow lab retriever like Marley. I'm glad you liked this book, though, LTG!